Home » Recipes » Desserts » Fudge Pie – Easy and Amazing! Fudge pie made with cocoa takes about 10 minutes to put together and 30 minutes to bake into the most delicious pie you’ve ever had! If you ask my family what they want for dessert, hands down every single one of us will say something chocolate. Chocolate Chess pie, chocolate cake, chocolate something—which doesn’t mean we don’t like other desserts too. Give me a good Creme Brulee any day! But overall, we crave chocolate. Which probably helps explain the preponderance of chocolate recipes on this site and why we love this fudge pie so much! I admit I’m a chocoholic. If it’s chocolate, I’ll probably eat it. And side note, if you love chocolate too be sure and try this Chocolate Silk Pie from my friend Stacey. And sometimes it turns out that the simplest of things can be the absolute best—which is the case with this chocolate fudge pie, also just called Fudge Pie. It’s one of those things that Southern cooks probably whipped up because they didn’t have much to work with, along the same lines as chess pie, and this pie is proof that less is often best. Fudge pie reminds me of my husband’s late sister, Carole—and thinking of Carole always makes me smile. She wasn’t much of a cook, so she would pick up a chocolate fudge pie from her local bakery as her contribution to the family’s Thanksgiving or Christmas dinner. When Carole first got married, her husband, Dale, didn’t know what he was in for. He thought he was marrying a domestic goddess. Instead, he would come home from work to hear her say that the roast she was cooking for supper hadn’t finished thawing and they would just have to go out. Little did he know she had taken the roast out of the freezer about twenty minutes before he was due home, sprinkled a little flour on her face for good measure, and pretended to be preparing dinner. I think one of the things that epitomizes the importance of food to me is that we have memories which are so intertwined with the foods we love—or hate, as the case may be (just ask my mother about making me eat peas…). Even though Carole never actually made this pie, I still think of her when I make it. And so, while she’s been gone ten years now, her memory lives on through something as simple as a chocolate fudge pie. What Do You Need to Make This Fudge Pie Recipe? A mixing bowl like one of these, a pretty pie plate, a whisk or hand mixer—that’s about it! See? I told you this Fudge Pie is super simple! Even my grandson Luke can make it! 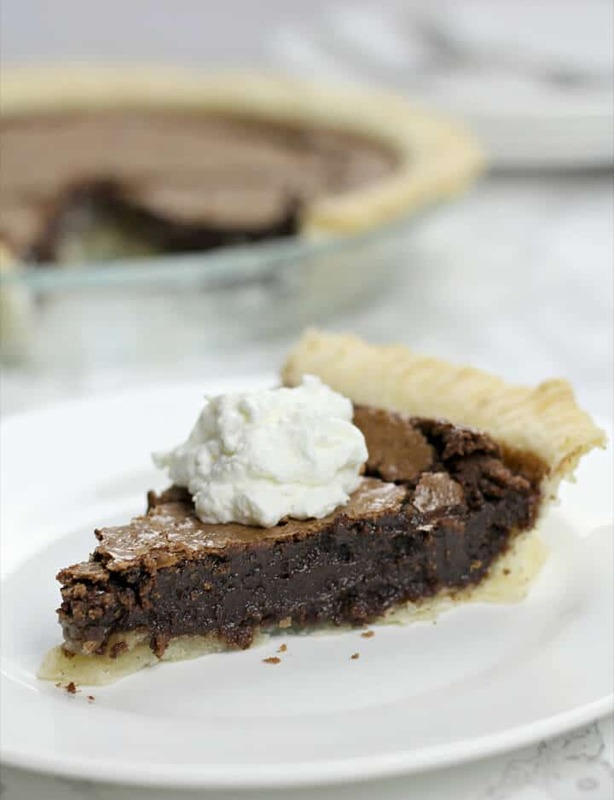 The ingredients for this delicious chocolate fudge pie are basic and stuff that you probably have in your pantry and fridge right now. As a matter of fact, after you make this fudge pie once, you’ll probably make sure that you always have these ingredients handy so you can make it again on the spur of the moment! With that combination, how can you go wrong? **Cook’s Tip: If you want to make homemade pie crust, this recipe is super easy. Otherwise, I suggest using the refrigerated pie crusts. I don’t suggest using a frozen pie shell and you can see why in my tips below. I love that this is a chocolate pie with cocoa, so you don’t have to bother with melting chocolate, or even remembering to buy chocolate. I may not always have baking chocolate in my pantry, but I ALWAYS have cocoa! This fudge pie recipe comes together in about ten minutes, bakes for about thirty—and then all that luscious, gooey, chocolatey goodness is ready to eat. My friend Frank said on Saturday, “That’s about the best chocolate pie I’ve ever eaten!” And I would have to agree. Start by melting 3/4 cup of unsalted butter in a large bowl in the microwave. Let that cool for just a few minutes, then stir in 1 1/2 cups granulated sugar. Use a hand mixer or whisk to dissolve the sugar, and keep in mind the sugar won’t dissolve completely until baking. The mixture will feel slightly grainy, which is perfectly fine. Add 1/3 cup all-purpose flour, 1/8 teaspoon salt, 1/3 cup cocoa, 1 1/2 teaspoons vanilla extract, and 3 eggs to the sugar. 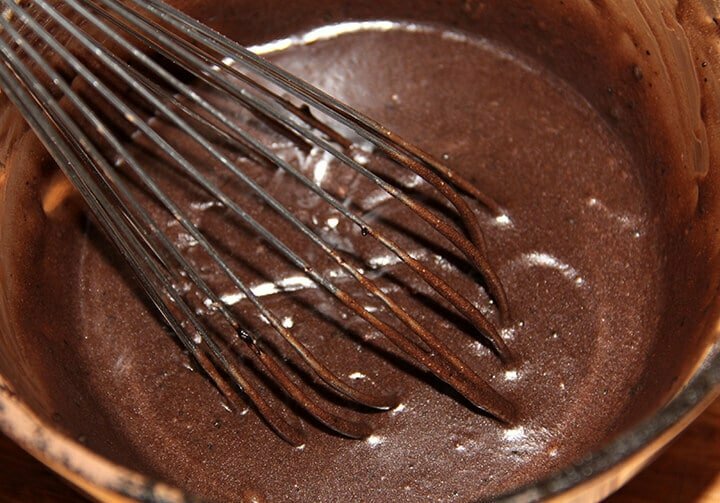 Beat or whisk all together until batter is smooth. **Cook’s Tip: I prefer to use a hand mixer but I have just used a whisk at times as well. This old-fashioned fudge pie recipe is a KISS pie—you know what that means! Pour the batter into a 9-inch pie crust and bake at 350° for about 35 minutes or until center is almost set. **Cook’s Tip: A frozen 9-inch pie shell is actually smaller than a regular 9-inch pie plate so you will have extra filling if using frozen. Take the fudge pie out of the oven and hide it somewhere. When the chocolate fudge pie is done, the top will have a slight crust and a few cracks here and there. It won’t look like anything special and isn’t even pretty. But once you cut into the pie, you’ll see where the deliciousness is hiding. Underneath that slightly crunchy top is a fudgy, gooey, chocolatey concoction that melts in your mouth and fulfills all your chocolate longings. Oh my! Doesn’t that look scrumptious? So I make either this Fudge Pie or my Cream Cheese Pound Cake when I’m taking something to a party, or when I’m taking comfort food to someone. I usually pair it with a simple meal of Roasted Rosemary Lemon Chicken, Green Beans, and Weeknight Mashed Potatoes. If we’re having this chocolate pie at home though, we might have it with these Baked Pork Chops with Cream of Mushroom Soup or Salmon Patties. I like to keep the whole meal pretty simple and easy! I use either homemade pie dough or a refrigerated pie crust that I place in my actual 9-inch pie plate. As a result of some of the comments, I tried this pie in a frozen pie shell and as it turns out, the frozen pie shell that is labeled a 9-inch is actually smaller than a real 9-inch pie dish. The frozen pie shell fits down inside my 9-inch Pyrex pie plate. Therefore, there is definitely too much batter and if you pour all of it into the frozen pie shell it will overflow. So, if using a frozen pie shell, either don’t pour all of the batter into the pie shell or use a deep-dish frozen pie shell. If using homemade or refrigerated pie crust in a true 9-inch pie plate then you should be fine. If using a frozen pie shell, you do not need to pre-bake. Here’s a quick how-to video for making Fudge Pie! This fudge pie is an old-fashioned pie that takes about ten minutes to put together and thirty minutes to bake into the most delicious, gooey, chocolatey pie you've ever had! Melt butter in large, microwave safe bowl. 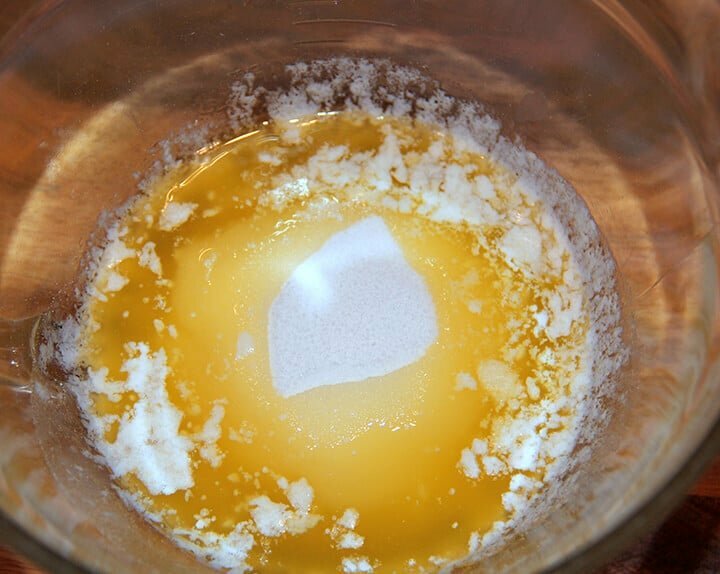 Add sugar to melted butter and use a hand mixer or whisk to combine until sugar is mostly dissolved. Add additional ingredients and beat or whisk until well blended. Pour into pie crust and bake about 25-40 minutes, or until center is set and toothpick has gooey wet crumbs. Make sure you don't overbake. Use a hand mixer for best results. Use a refrigerated pie crust or homemade. If using a frozen pie shell, only pour the filling to the inside top edge or the pie will overflow. Or use a deep-dish pie shell and adjust baking time accordingly. 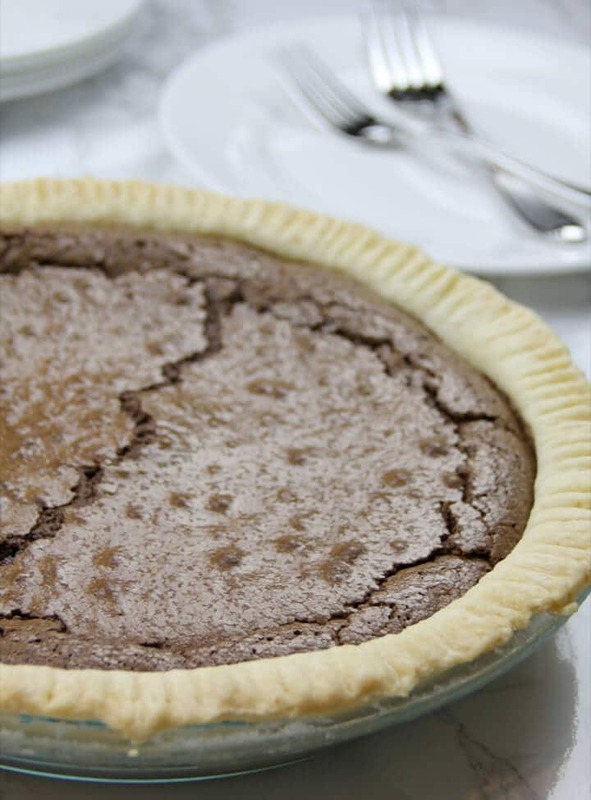 Adapted from Southern Living's Fudge Pie in Quick and Easy Recipes. Are you making this recipe? Tag #SouthernFoodandFun on Instagram. I LOVE to know when someone feeds their family with one of my recipes! Update Notes: This post was originally published September 13, 2011, and on October 13, 2018, was updated with one or more of the following: step-by-step photos, video, updated recipe, new tips. This was so easy and so delicious! My whole family enjoyed it and we made another 2 days later! Should I bake the frozen crust first? I would not bake the frozen crust first. Please see the notes about using a frozen crust–it probably won’t hold quite all the batter, so be sure you don’t overfill and be sure to cook the pie on a foil-covered baking sheet. Merry Christmas and hope you enjoy! How long does the Fudge Pie need to set after it’s done baking? Usually someone in my family, possible me, cuts into this pie the second it comes out of the oven! That’s a little too soon but it’s so yummy when it’s warm. I would try to let it set at least 15-20 minutes before serving. My three boys (15, 12, and 7) request this pie every birthday, special occasion, and holiday! I love how quickly and easily it comes together. Oh, and even though it is DELISH on its own, I made it for company and added some coursrly chopoed pecans. WOW!!!! I’ve made this several times and my family loves it. The second time I put it in 2 regular frozen crusts and didn’t bake it quite as long and it turned out like a tart, they loved it just as much. Thank you for publishing this. Kathleen, thanks so much for posting this. Some folks have had issues with frozen pie shells so it helps to have tips from someone who has done it! I’ve tried this twice and both times it is just a runny mess and never bakes completley . I did use a frozen pie shell , but poured some out. When I cooked it longer the top burns . looks like others have had luck … can’t figure it out! ? I’d love to troubleshoot with you and try to figure out why the pie isn’t working for you. I’ll send you an email and see what we can come up with. Could be oven calibration or rack position or something simple like that. Thanks for your comment. Made this today. Used a hand mixer. The batter fluffed up and was a light brown. Put it in a frozen 9 in pie crust and within minutes it was oozing all over the oven floor, smelling and burning. Yuck! Thinking something may be need to be tweeked on this recipe a bit. So sorry that happened to you! I’ve made this recipe many times and it does puff up while baking but mine doesn’t overflow. Not sure what could have gone wrong but I do hope you’ll try the pie again. Maybe use a wisk instead of a hand mixer so the eggs don’t fluff too much? I used a deep dish pie crust too..
Hi! Thanks for the recipe. Here’s how I make it! I make the batter exactly the same, but I don’t put it in a pie shell. I just put it in a 8×8 square glass dish and bake it like that. I then scoop it into a bowl and top it with vanilla ice cream! It is soooo good! When we want some the next day (or maybe another helping a couple of hours later! ), I microwave it for a few seconds to warm it up again. Give it a try! It’s kind of like lava cake or maybe lava brownie? Thanks again! Oh, I love that! So great to start developing a love of cooking when they’re young. Good job, Mom! I do not pre-bake the pie crust for this pie, but you certainly could for a little bit. Thank you!!! Can’t wait to bake today ! Hi! If I have salted butter on hand, can I use that and just leave out the 1/8 tsp of salt? I think that would be ok, but I’d probably go ahead and toss in the 1/8 tsp of salt with the flour anyway. I rarely use salted butter so I don’t really know HOW salty it tastes, but I doubt that it would make the pie too salty. Hope it turns out well! I had the same issue with the sugar not disolving. I didn’t wait for the butter to cool. Read it after I ran into the problem. I’m no baker. Cooking this for a party in graham cracker crust. This recipe doed not fit on a reg pie crust. It overflowed and made a huge mess. My ingredients are exactly right. My sugar did not dissolve. Should I put it back in the microwave so it gets hot and dissolves? You can try that or just go ahead and finish the pie. The sugar will cook into the filling and I bet it will be just fine! This pie looks delish. After i melted butter and i poured all the sugar in and began to whisk. It was very sugary and i could not whisk it away to being smooth. I realize now, i think i should have allow the melted butter to cool. Gonna try one more time since it is so quick. 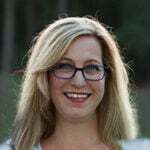 Love stories from the kitchen and your sister in law sounds like a hoot!! Sorry for your loss but so glad you have a funny reminder of her in your kitchen ! It seems that nearly everything I cook brings memories of old friends and strangely enough, cooking helps me draw on fond memories of friends turned “no longer friends”. The kitchen is my happy place because it brings warmth and smiles to my loved ones faces. I cannot wait to mAke this ( I have to use coconut oil instead of butter , I’ll let u know how it turns out? It is delicious at room temperature. I never refrigerate it so I think you will be fine. Do you use a frozen pre-made crust? If so should the crust defrost first? I don’t typically use a frozen pie crust but I would follow the instructions on the pie crust package as to whether to thaw or not. Note – if you do use frozen, I discovered they are actually smaller than my 9-inch glass pie plate so don’t pour all of the batter into the frozen pie crust or it will overflow and make a chocolate mess! I am obsessed with this pie lol. Making it again tomorrow for my Mom’s birthday!! She used to make a fudge pie years ago but lost the receipe. Thanks for sharing we are in Chocolate Heaven!! I made this pie for my brother and only got a small piece. Then I tried some others, this one is by FAR the best one!! Thanks!!! Thank you, Debbie! I’m so glad you enjoyed the pie. It’s one of our family favorites. My pies are in the oven i learned to bake pies by my great uncle he was famous for his fudge pie and i was the only one who carried his recipe in the family so when he passed i continued the tradition well it has been a few years since i last made one and two kids,later my mind got a little fuzzy i could remember a few things so when i got asked to bake the famous pies i was too embarrassed to say i forgot considering im the only one who knew but after seeing this recipe it brought it all back to me thank you for helping me keep my great uncles famous pies alive today! That’s so great…I hope your pies turned out fantastic! I did exactly what the recipe said but mine just turned into a brownie on the inside 🙁 do you know why that happened? Lindsey, I’m sorry that happened! I don’t know why unless maybe it cooked too long. Ovens can have different calibration so yours could be hotter. Hope it still tastes good! It just taste like brownie so I guess it’s fine. Just not what I was looking forward to xD I’m going to have to try again and just watch it closely or turn the heat down. I thought that was probably the problem. Be sure to use all purpose and not self rising flour or it will be brownies. The recipe does specify all-purpose. Thanks! I worked for a catering company and we did a lot of funcitons in a victorian home in the nw area of arkansas, and my boss made these. He always made sure he made me one of my own, and i asked for the recipe for years and he wouldn’t give it up. So now with the computer age i was able to find it and WOW it’s funny how something like this can bring back such awesome memories. My friend is now deceased and i think of him often. Just wanted to share that!!! Food is all about memories. Hope you had a great Thanksgiving! Just curious if you have ever tried this with a graham cracker crust? I have not but I’m sure it would be delicious! I often use graham cracker crust with pies, and they are always better to me and my family. Can I substitute chocolate syrup for cocoa powder ?? No, I don’t think that would work. Chocolate syrup would dilute the flavor and change the texture. LUCY,I Love your story! My mother-in-law always made this for me and it was my favorite! She always made one for my wife and kids and one just for me that no one else was allowed to touch! The old stories about hating your mother-in-law is definitely not true in my case. She lived with us for 10 years and I loved her and her chocolate pie! Love that you were close to your mother-in-law. Food is such a huge part of family lore and family life. Thanks so much for visiting In a Southern Kitchen! I am headed to grocery. I need to make this ASAP!!! You will love it! So easy and so yummy. Is this chess pie? I’ve never had it, but always wanted to. This looks fantastic. This is not chess pie, although there is a chocolate chess pie. The texture of this pie is different from chess pie. It’s delicious so give it a try and let me know what you think. Don’t wait til Thanksgiving to try this pie! You will love it.